This Classic Kruger National Park safari tour is an ideal option for travellers who want to experience the wonders of South Africa’s iconic national park and its incredible animals and birds, including the famous Big 5. The tour includes 5 full days in the Kruger Park which provides ample time to explore the southern section of the Park which is renowned for its diverse habitats and high concentrations of game. The Kruger National Park falls within the internationally-declared Kruger2Canyons UNESCO Man and Biosphere and is the largest national park in Africa, stretching up to Zimbabwe in the north and Mozambique in the east. 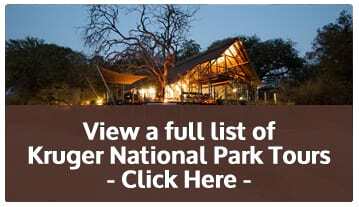 Guests stay in bungalows in Pretoriuskop Rest Camp in southern Kruger National Park. Pretoriuskop Camp is one of the oldest camps in the Kruger National Park and located along an ancient explorers highway that’s rich in history. Much of its rich cultural heritage has been retained by keeping the traditional round huts but modern facilities have been added such as a restaurant, shop, petrol station and one of the best swimming pools in the Park. The units are traditional 2-sleeper bungalows known as Kruger rondavels (round huts). Depending on availability, you can request a family guest cottage. It has a small lounge and kitchenette and two bedrooms suitable for 2 adults and 2 children. Breakfasts and dinners are prepared in a camp kitchen in a private section of Pretoriuskop Rest Camp and served in our open-air dining tent. It’s a lovely way to experience the African bush, dining under the stars around a campfire. If it’s raining, dinner will be served in the camp restaurant. Pretoriuskop Rest Camp has an onsite restaurant for take-aways and a Park shop for drinks and snacks. Stock up before leaving for the 3-hour game drive but please note; no alcohol may be drunk on the open safari vehicles during game drives. Cell phone signal is available in camp but not Wi-Fi. Purchase a Sim card with Pay As You Go data to access internet while on holiday in the Kruger Park. A special feature of the historic rest camp is an enormous swimming pool built around a massive granite rock. Guided bush walk with a SANParks ranger around Pretoriuskop surrounds. Experience the bushveld from a different experience on foot. A tour of the world-famous Panorama Route includes the Three Rondavels, Blyde River Canyon, Bourke’s Luck Potholes, God’s Window and the newly-opened Graskop Gorge Lift. It needs to be pre-booked and can only be accommodated time permitting and as long as it doesn’t interfere with the safari tour days and times. We depart from Johannesburg between 06h00 and 08h30 depending on collection arrangements. It’s a 5-6 hour drive that takes you from the Highveld on a scenic route down the Lowveld escarpment to the main entrance to the southern section of the Kruger National Park. Stop for lunch enroute (for your own expense). Settle into your bungalow at Pretoriuskop and freshen up. Depart for a late-afternoon game drive in a SANParks open safari vehicle with a Kruger Park ranger. They’re allowed to take guests out for night drives and return to Pretoriuskop after normal gate closing times. Please note: Children 6 years and younger are not permitted on open safari vehicles. A 3-course al-fresco dinner under the stars served at our private camp within Pretoriuskop. Early wake-up call because the best time to see game is as the sun is rising. There’s time for tea or coffee and rusks (South African dunking biscuits) before departing for the early morning 3-4 hour game drive. Return to Pretoriuskop late morning for Brunch and a few hours of relaxation in your bungalow or around the camp swimming pool. Depart for a late-afternoon game drive same time as the first day. Wake up early for hot beverages and rusks and then depart for a sunrise game drive. Enjoy a light breakfast back at Pretoriuskop Rest Camp before packing up and departing for Johannesburg. Arrive in Johannesburg between 17h30 and 18h00, depending on late-afternoon traffic.